A: The biggest are the Social Security trust funds (16 percent), the Federal Reserve banks (12 percent), China (8 percent), Japan (7 percent) and mutual funds including money-market funds (6 percent). I keep hearing about the debt ceiling and the U.S. borrowing more. 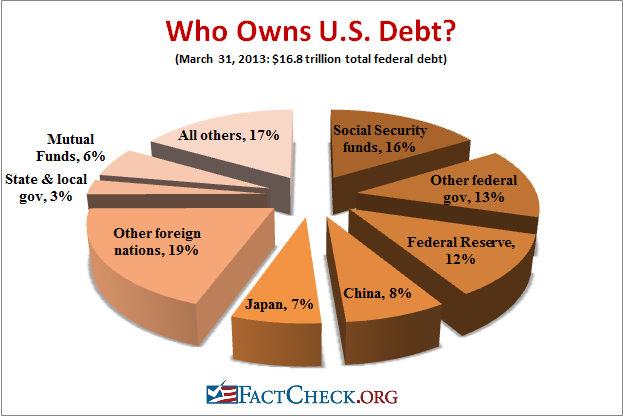 Who are the holders of U.S. debt? Meaning who, exactly does a country of our size borrow money from? Thanks. Our primary source is Table OFS-2 in the September issue of the Treasury Bulletin, which can be found under the heading “Ownership of Federal Securities.” For additional details, we’ve also drawn on reports of the Federal Reserve System and other U.S. Treasury documents. As of the end of March 2013 — the most recent period for which the Bulletin provides a breakdown — total federal debt stood at $16.8 trillion. It has since grown to nearly $17.2 trillion, but the share of debt held by various lenders cannot have shifted by much. The largest portion of the total debt — about 40 percent — was held by federal government accounts plus the Federal Reserve banks. Since 2009, the Federal Reserve banks have been sharply increasing their holdings of Treasury securities to stimulate the economy, and as of March 31, they held just under $2 trillion of the national debt, or about 12 percent. The federal government accounts include the two Social Security trust funds, which together hold 16 percent of the total federal debt. Other federal government accounts include the federal civil service retirement and disability fund (5 percent of total debt), the military retirement fund (3 percent), the Medicare hospital insurance fund (1 percent), and several other smaller funds. Another 34 percent of total federal debt is owed to foreigners, including China (which owned nearly $1.3 trillion of the total debt, or about 8 percent), closely followed by Japan, which owned $1.1 trillion, or 7 percent. Previously, Japan had been the top foreign owner of U.S. debt, but China surpassed Japan in September 2008. Other major foreign lenders are various Caribbean banking centers including the Cayman Islands (2 percent altogether), various oil-exporting nations including Saudi Arabia (2 percent altogether) and Brazil (2 percent). The remainder of the total federal debt is spread among mostly private, domestic investors, including 6 percent owned through mutual funds, such as money-market funds. Another 3 percent is owned by state and local governments. The remaining 17 percent is spread among banks and other depository institutions (2 percent), owners of U.S. savings bonds (1 percent), private pension funds (3 percent), state and local pension funds (1 percent), and insurance companies (2 percent), with the remaining 9 percent held by various “individuals, Government-sponsored enterprises, brokers and dealers, bank personal trusts and estates, corporate and non-corporate businesses, and other investors,” according to the Treasury. “TABLE OFS-2.—Estimated Ownership of U.S. Treasury Securities.” U.S. Treasury Bulletin. Sep 2013. “The Debt to the Penny and Who Holds It.” U.S. Treasury website. Accessed 19 Nov 2013. “Federal Reserve Banks Combined Quarterly Financial Report, March 31, 2013.” Board of Governors of the Federal Reserve System. 31 May 2013. “Note 3. Intragovernmental Debt Holdings, Monthly Schedules of Federal Debt.” U.S. Treasury, Bureau of the Public Debt. 31 March 2013. “Major Foreign Holders of Treasury Securities.” U.S. Treasury. Undated document accessed 19 Nov 2013.